Weather: sunny and started off very cold (-14 C in the morning), then milder, eventually up to -5. Low of -4. The rink had its busiest day since it was rebuilt in 1993. 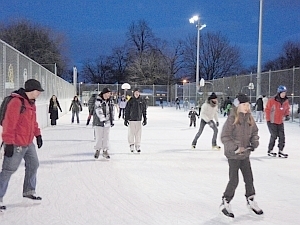 Many of the other outdoor rinks that were open across the city were also very full. Poor North York -- all their rinks except the one at Mel Lastman Square were locked. 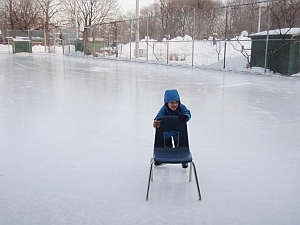 The central rinks didn't have any zamboni staff for the day (only the Etobicoke rinks got ice maintenance staff), so the rink staff and users did ice maintenance manually (with the green scrapers) three times: at 11 a.m., 3 p.m. and 7 p.m. Weather: sun and cloud, high -1 C, low -5. Annoying snowflurries in late afternoon, early evening, in between clear skies, made it necessary to hand-scrape repeatedly. But the crowds continued. One of the young teens' i.d. disappeared and - despite a search of every corner of the skate room, in case it had slipped down -- it never re-appeared. She was angry that she'd have to get a new i.d. card, and said with a steely voice: "when I leave my i.d. here, I expect to get it back!!" Fair enough. It's hard not to snap back, though -- "honey, did you notice the number of people renting skates this afternoon? Do you realize this is operation done on a shoestring, which is why you and your friends can meet here day after day, skating or kibitzing with each other inside by the woodstove, for only $2 a pop? The skates are sharpened for you, broken laces are replaced, i.d. is filed, and this is only the second time this season that there's been a mistake -- plus one $200 theft of skate-rental deposits, which the rink program had to swallow." The interesting thing about making things work well, is that many people quickly come to take it for granted. The machinery fades into the background, invisible. On the other hand, people get big ideas. After the evening shinny hockey time was packed on both the hockey pad and the "pond" side, a bunch of the players said -- "this place needs two or three more pads. Come on, let's get the city to build a bunch more pads right next to these two, -- they'd be full right away." But they also said that they don't use the rinks nearer to their houses, because the ice maintenance is bad. Better to fix up the rinks that are not working, rather than build new ones! And cheaper. Ice maintenance: 9am, 1:30pm, 5:10pm, 7pm manual scrape, 9pm. Peter Kuitenbrouwer, writing about tonight's ice maintenance in the National Post, (January 4 2009) Our group, which has a city permit, arrived for the 9 p.m. skate. A few centimetres of snow had recently fallen, and a city worker was clearing it off with the Zamboni. Having removed the snow, she drove off to clear the pleasure rink. "Aren't you going to flood?" I asked her. "My shift is ending," she said. "Unless I get a call from my supervisor to work overtime, I'm going home." She left us with a rutted mess of an ice surface, a washboard permeated by deep gouges. At one point I tried to turn backwards, lost my balance and smacked, theatrically, on the ice, whacking my helmet-clad head on the ice. "Wow," said another player, after making sure I was okay. "That was a garage sale!" Weather: high -3 C low -15. Sunny all day. Today was perhaps the busiest day yet in the holidays, and no wonder, with perfect winter weather and a (pleasantly thin) layer of still-white snow over everything. The last skaters, taking off their skates at 11 when the lights turned off, seemed reluctant to leave even then. One of the skaters thanked the staff person who was locking up, saying that he had been at the rink much more than at home, and that these rinks were just wonderful, and he appreciated the rinks, and the staff who run them, so much. Such testimonials are surely a nice nourishment for the trouble-shooting (and sometimes careworn) rink staff, dealing with hundreds of people every day. Ice maintenance: 8am, 1:30pm, 3:30pm, 5.30 and 8:55pm. Weather: high 1, low -5. There was a nasty forecast of freezing rain but it never really came about. This was the last day of the holidays, and despite the dark clouds much of the day, there were still plenty of skaters. Near the end of the day, around 8 pm, the zamboni driver was driving very fast up and down the hockey ice. It was puzzling and alarming to watch -- how could he be cleaning the ice that way, and if he wasn't resurfacing, why was he driving like that? He looked really grim. Who knows why he was mad (if). He told me a few days ago that he had a fall in the parking lot of the Parks service yard last weekend, and sprained his leg. Maybe he was in a bad mood because of that. But the rink staff looked worried when that zamboni driver was on the ice. They took extra care to make sure the skaters stayed far back when he was resurfacing the open "pond" side of the rink. 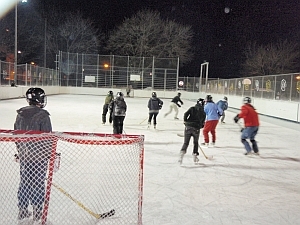 The rinks operate during the cold, dark time of the year. It's hard not to be alarmed at times. The easy, light breezes of summer aren't there. There are rainstorms and snowstorms, and jangly alarms sometimes go off around the big machines. The ice resurfacers and plow-trucks go back and forth so much, they can bump into boards and gates - splintering wood, and twisting metal gates so that they don't close right anymore. The rest of the park is often in darkness, with only the rink standing out, an oasis flooded by powerful rink lights. Usually it feels fine, and to the skaters it often feels better than fine. But tonight it felt uneasy. Ice maintenance today: 9 am, 12 noon, 4.55 pm, 8 pm. Weather: a perfectly beautiful winter day, sunny all day, high - 1C, low -9. At night the sky was clear and there was a half-moon above the rink. The rink moved at a much more pleasant pace, now that the holidays are over. At 10 pm the Dufferin Groove permit was on the hockey side, and there was a very fast game on the "pond" side as well. Ice maintenance: 8.45 am, 1.30 pm, 7 pm, 8.50 pm. Weather: Sunny, high -1, low -10. Ice maintenance: 8.30 am, 1.20 pm, 4 pm, 7 pm, 8.55 pm (last one was only partial because the augur got stuck and there wasn't enough hot water to free it). Weather: High 1, low -2. heavy, wet snow alternating with ice pellets and a bit of rain. The zamboni worked for hours, from 9 a.m., taking off three inches of heavy snow, no plow. Eventually the plow came, but only stayed for an hour and a half. The zamboni ran low on fuel and had to leave the ice. It came back for a half hour in the early evening and did the hockey side again, but didn't do the pleasure side because the driver was worried he'd run out of fuel before he got to the garage. The pleasure rink had a lot of snow on it and there were arguments between the hockey players and the pleasure skaters, about splitting the hockey side ice. The zamboni came often today to try and shave the ice smooth again -- the combination of snow and rain yesterday bonded onto the ice and made the surface very uneven. The zamboni had trouble too -- at one point it sprayed all the snow outward, that the augur took up. But then the zamboni driver was able to fix it and it ran again. The rec staff spent several hours, off an on, chipping away deep ice that was blocking the gates from closing. One of the staff said his arms felt like spaghetti afterwards. And then he stil had to cart things around, because the farmers' market was back and the rink house was full of hubbub. Weather: high -5, low -7. A beautiful day, sun and cloud, lots of people at the rink in the afternoon and evening. 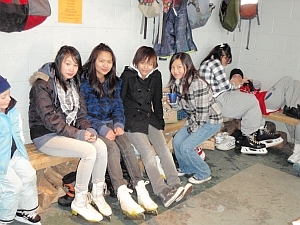 Friday night continues to be the night for the young teens to socialize, to see and be seen at the rink. Ice maintenance: 9am 12 noon 3.30 pm 7 pm and 9 pm. Weather: High - 6, low - 14. Snowflurries off and on in the afternoon, then snow starting around 8 and not stopping until after midnight. The rink was so busy in the afternoon that people said they couldn't find anywhere to sit, in or out. There must be seating for a hundred, and even so, it wasn't enough. 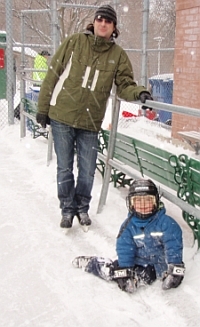 Toronto likes to skate in the winter, too bad that our attempt to "spread the wealth" to Christie didn't work. Ice maintenance: 9 a.m., 1.30pm, 5.15pm. The rink had so many people on it that skaters asked rink staff to get an earlier scrape at 4pm (right after one of the snowflurries). The rink coordinator was unable to get this for the rink. So rink users together with rink staff scraped both sides manually. Dufferin Rink is supposed to have the same amount of rink staff as Rennie Rink. 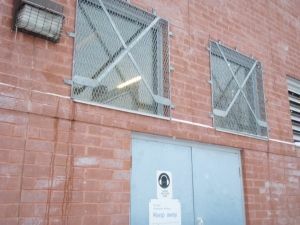 But Rennie Rink is scraped hourly when it needs it, whereas it seems that a request to clear Dufferin Rink when it needs it, doesn't get results. Happily, City Councillor Adam Giambrone has now become aware of the problems and plans to meet with the Park management and fix them. Weather: -12 in the morning but then it went to -7. Cloudy with a few sunny times, then snow starting in the evening. A few youth stayed and played hockey in the snow with an orange ball. Other youth stayed inside until they were finally forced to go because the staff wanted to get home. 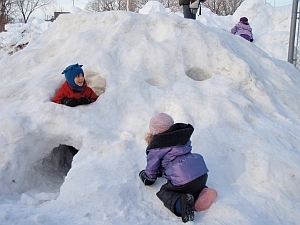 When they finally go out in the snow, they tumble around, getting snow all over themselves -- as though it was styrofoam, as though it wouldn't sink in and make them cold after. Many of them don't really even wear winter clothes -- no gloves, no hat. I'm guessing that some of the kids who hang around the rink house without skating aren't the kind who shovel snow either, so they may not have taken the step that would allow them to be competent in winter weather. They seem to just endure it. Weather: warm (+1 celsius) in the morning, with yesterday's snow melting off tree branches. Then the temperature went down to -16. In the evening the zamboni driver pointed out that there were two very thin patches in the middle of the hockey ice. Weather: in the morning it was -21, and only a few skaters came. But it went up to -13 in the afternoon. The zamboni driver gave an extra flood to the thin patches, and said that if they're still there tomorrow, he'll put snow on them and thicken them up like that. There was a good crowd out for the women's hockey permit, smaller for the pond hockey on the other side. Of course everybody got free cookies, since by later evening it was -15, and that's the cut-off when cookies might be needed to give skaters the extra energy to thaw out. Three of the staff got half a lesson in how to use the new skate sharpening machine. It couldn't be a full lesson because the sharpening diamond is chipped and Dan Watson has to e-mail the company for two new ones. Sharpening diamonds cost about $20 each and they get sent by Purolater, not by armed guards like jewellery diamonds. The wood stove is making the rink house smell a bit smoky -- odd. So a special inspector is going to check it out for us, before anybody makes any more fires in the stove. Ice maintenance: 9.30 a.m., 1.30 pm, 3.15 pm, 7 pm, 9 pm. Weather: high -12, low -19. Market day - but not as many people came as usual. The woodstove inspector came -- a neat guy named Ron Wickett, whose company is called Summit Inspection. He was recommended to us by Marsh's Stoves, the people who sold us the rink woodstove 13 years ago. The news was better than we thought -- he said the main problem was that tjhe interior liner bricks had begun to disintegrate (indeed they had!) and that made the whole stove not work so well. He went and got new liners and installed them and the staff made a fire, and before long, people were sitting in front of the woodstove again, watching the flames. A good thing, too, because it was darn cold. The zamboni driver had some trouble doing the ice because the augur froze up a few times, but eventually he got it going and put extra water on the thin spots. Ice maintenance: 9 am, 12.30, 7 pm, 9pm. The pond hockey crew didn't show up (very unusual), but the Thursday night older men's shinny permit came out in large numbers. They were having a really fast and exciting game when, a few minutes after ten, the lights suddenly went off. The players skated around waiting for them to come back on, then most of them went inside, to warm up by the woodstove until the lights came back. But it was pretty obvious that the problem was bigger --the mall went off, and all the houses to the east of the park were dark, all the street lights were gone, and then the apartment building next the rink switched off too. Shades of 2003! All the light remaining was from the rinkhouse emergency lights and the glow from the woodstove. So everybody changed, we brought out the cookies (the minus 15 rule, free cookies for skaters), and then they all went home. Weather: high -14, low -20. Sunny most of the day. Most of the neighbourhood was still cut off from power, i.e. heat and light, until 9.30 pm. The park's power came on again in the early morning, though, so the rink house warmed up and the staff put in a fire. Lots of schools were closed because of no heat. There were some extra kids at the rink, but not many. 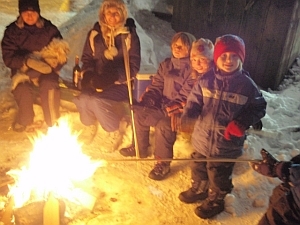 There were some non-skating families who came and sat by the woodstove just to get warm, from their cold houses. At suppertime there were people who came just to get supper. But skaters were few. If your house is freezing, you don't much feel like going to an ice rink! Ice maintenance: 9 am, 1.30 pm, 3.15 pm, others unrecorded. Weather: started out at -20, then went up to -7: a relief! The rinkhouse was very cold in the morning. A City technician came out and said he didn't know what was wrong, so he called in a contractor, who said that the furnace filters were so clogged that they had tripped the circuits and the power was off. He took out the filters for the weekend and then the heat came back on. Ice maintenance: 9 a.m., 1.30pm, 5 pm (scrape only because it had begun to snow). Then word came that there was a problem with the flying squad trailer, and the Dufferin Rink zamboni driver left to help them. Soon after he left, two cement patches showed up in the middle of the hockey ice. Since they were snow-covered, the staff were able to put pylons over them, and they said they would point them out to the zamboni driver when he came back to do the next ice maintenance. But he didn't come back and the staff couldn't get an answer when they tried to page the supervisor. So that was the end of any zamboni ice maintenance. The snow kept falling. At 7.30 the rec staff and rink users shoveled off the ice. The zamboni driver came back at 9.15, said the ice was too snowy for the machine, and left for the night. A big group of hockey players came at about 9.30 and shoveled off half the ice, and played hockey. At Ramsden, meanwhile, the zamboni driver stayed on site the whole time (same at other double pads, we hope) and kept on clearing the snow off the ice. Weather: nice and mild again, high -5, low -11. It snowed lightly all day, and the rink was really full of people, all of them relieved, perhaps, to be back to a normal life without blackouts or bone-chilling cold. Ice maintenance: Plow and zamboni from 9, finished getting the snow off at 11.30. Rec staff and rink users shoveled off the ice at 2pm. Zamboni, scrape only at 3.15, then again at 5.15 (after Family shinny program had already begun). Rec staff and rink users shoveled off the rink again at 6.30, then zamboni at 8. With this much rink use, it's time to ask that Dufferin Rink keep its maintenance staff on-site to do the ice as needed, as is the case with the other double pads (mostly). Dufferin Rink was so busy again today, and because of the crowds and the light snow all day, the rink needed the same kind of steady, weather-responsive ice maintenance that Rennie Rink gets. Instead, the rink users had to clear it themselves twice, and twice yesterday. I have the impression that rink staff have to call you and ask specially for weather-responsive maintenance, and then it's still a cliffhanger whether the zamboni driver will return to the rink or not. So I'm wondering -- does Dufferin Rink have a designated zamboni driver on every shift, or not? If not, why not? And if so, why does he not stay at the rink during heavy-use times or snowy days, as the Rennie drivers do? Weather: high -3, low -12. Snow sifting gently down for much of the day. Lots of school visits, rink users shoveling. The zamboni drivers worked at filling in the thin spots that seem to be all over the ice. One driver does it one way, the other one does it another way -- everybody has a different opinion. But it's a puzzle -- why is the ice so thin in so many places on the hockey side? The pond hockey group were back, good-humoured as always. There were no subs, so they skated for almost two hours. Impressive. On the hockey side, the "Dufferin Groove" permit had a gigantic turnout. It's almost getting to the time when people will begin to get anxious about the imminent windup of the outdoor rink season. But first -- another deep cold period coming this weekend, this time hopefully without a power outage. Ice maintenance: 10am no flood. Just scrape. Concrete patches pointed to driver who patched one big one up. 1:15 scrape and flood both sides, 4:30 late flood for hockey pad, scrape of pleasure side, 7pm, 9pm. Weather: High -10, low -16. Sunny all day, but not warm, and going down. In the morning there were lots of kids from Queen Vic School, but then later the rink was pretty empty -- some people said it's because everyone was watching Obama's inauguration on TV. Ice maintenance: 9am hockey scrape and flood, pleasure side scrape only, 1.35 same as above, 3;15 scrape and flood hockey and pleasure, 7pm s&f both sides, 9pm s&f both sides. In the evening after nine there were a lot of people on the "pond hockey" side -- the pleasure-skating side which is only allowed to be used for hockey after the rink building closes. The zamboni driver gave them a nice flood and helped to bring the shinny nets out, and then the game began. Drop-in women's shinny was on the other side, also well attended. 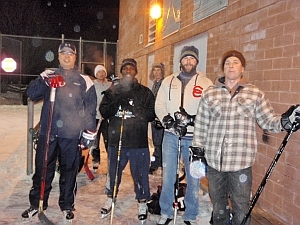 Four guys were there from Etobicoke, who talked about how much they like to play shinny at Prince of Wales Rink. They recently discovered that there's rarely much of a crowd in the daytime, "but you can never get in there at prime time, it's always permits." So today they played at Prince of Wales from noon to four, went home to eat dinner, and then drove to Dufferin Rink to play some more. Some of the regulars were there too, although there were many new faces. One of the loyal regulars is a very keen shinny player named Will. His mother was in town, visiting from Orillia, and she came to the rink tonight to have a look around. Will is one of the few skaters who regularly reads the rink diary, and his mother knew about it too. She said that she finds Toronto a bit too big now......but sometimes it seems very small, with ordinary, friendly stories being passed around among ordinary people, such as the ones who come to the rink, and those of us who work there, and people's mothers who visit from out of town. In that context, extraordinary people can find a toehold too. There is a women, M., who stands in the middle of the park in all seasons and sings loudly and alarms people with her odd comments. She has made friends with the rink staff, and when it's cold she often comes to the clubhouse, carrying big bags, and spends time inside where it's warm. The staff give her food, and have become very fond of her. She just sort of belongs there. It's interesting to watch skaters as they lace up their skates and look uneasily at M. doing one of her unusual monologues. When the staff, and others who have come to know M., make jokes and put an arm around her, you can see the other people's faces relax. The context is solid enough that it can carry a certain portion of odd behaviours. That also includes H., who is sometimes quite delusional, other times just a Maritimer who likes to drink. Tonight he was perfectly compos mentes, just standing at the door waiting for a cab to take him to the shelter for the night. He often sleeps in the park, but minus 16 is too cold. When the cab came, he said goodbye to the people in the rink clubhouse as though he was leaving a friend's house. No big deal, and his shopping cart with all his stuff is safely stored in the garage for the night. Meantime out on the rink, the game followed its pattern under the night sky. Weather: High -5, low -8, cloudy. Ice maintenance: 9am scrape and flood both sides, 2pm scrape and flood hockey side plus edger, 3:15pm scrape and flood both sides, 7pm scrape and flood both sides, 9pm scrape and flood both sides. Lots of school kids again today. Weather: High -2, low -5. Cloudy most of the day. Ice maintenance: 9am, 12:30pm, 2:30pm (scrape only), 7pm scrape only, 8:55pm s/f. There were several spots that were very thin, just barely covering the cement. The permit people put up a circle of pylons, and at the end they put in some slush to patch the holes. The "pond" side was much better. Shinny hockey regular Will was there again, this time introducing his father, also visiting from out of town. We're hoping to be introduced to some cousins next. I think certain ice maintenance problems have reached a critical threshold. 1. Dangerously thin ice in the middle of Dufferin Rink. As you may know, thin ice near the centre has been a problem for some weeks -- tonight it was almost cement. Dufferin missed two floods today even though the market was NOT busy and there were few people around. Even so, I'm wondering if it's time to get a consultation from CIMCO -- sometimes in the past they've had to change a central setting. The rink was busy all day, very friendly. NO response to yesterday's e-mailed heads-up about the thin ice. Weather: still minus 18 by 11 a.m. Still, it was so sunny that by the afternoon it felt warmer, and indeed it rose to -13. Low tonight - 15. The rink recreation coordinator was asked by rink users about extra floods to repair the thin patches on the hockey side where the cement is clearly visible under the ice. She tried to call the supervisor at about 11 a.m. to ask, but evidently there was no response. She called a weekend foreperson, but he apparently didn't know where the zamboni driver is -- said he would try to find him. A few minutes later the rec staff's phone rang and a group of rink users could clearly hear the voice of the zamboni driver yelling, telling the rec staff to fix the ice themselves, with buckets of water, and saying various other things that were hard to understand. The rec coordinator appeared to be shaking, and the voice on the other end sounded very aggressive. He never did show up until well after 12 noon, and then he just did the 1 pm ice maintenance early. No more after that -- so during the earlier shift there was no extra water put on except what the program staff hauled there in buckets. The rink coordinator said she'd keep trying to get more floods, since by now everybody is aware of the problem; the hockey players keep asking what the staff are going to do about it. On the afternoon shift, the coordinator was much luckier. The zamboni operator did slow floods at 3.15, 5.15, 7, and 8.55. In between, the rec staff poured more water on. So by nightfall it was noticeably thicker. Today was not as busy as normally on Saturdays, since it was so cold. Good thing, too, because the minus-15 free-cookie rule applied, and if it had been busy, there would have been no cookies left to hand out at the end. Ice maintenance: 8.30 a.m. s/f, 12.20 pm s/f; 3.15 pm s/f, 5.15 pm, s/f, 7 pm s/f, 8.55 pm s/f. Weather: started off at minus 14, climbed up to a high of minus 10 (!). But sunny enough that the rink was quite busy. Ice maintenance: the grumpy zamboni operator from yesterday said he did three floods before 8 a.m., and the ice is much improved from last night and today. Another s/f at 5 pm and another one at 8 pm. Weather: Minus 14 in the morning, then up to minus 8, and sunny, but it never felt very mild. Ice maintenance: 9am s/f, 12:30pm s/f, 4pm s/f, no maintenance at 7pm, nothing at 9pm. In the daytime rink use was light -- so many people are staying indoors with this cold. But at night-time they came out in droves. There's a running joke with shinny regular Will Lam, whose mother came a week again, then a few days later his dad, and tonight it was his sister, visiting from New Zealand. She skated, she says, for the first time in years. It was a strange evening, as the "situation" that began on Saturday morning continued to escalate. There was no ice maintenance at all after 4 pm, and as the snow built up, from all that fast hockey, the rinks users finally had to take the big green scrapers and clean the ice themselves. After the permit was over, there was plenty of talk in change room. Plenty of curiosity, too, and puzzlement -- how could a rink that's so good and so popular, not get better treatment? Good question, hopefully there will soon be some answers. 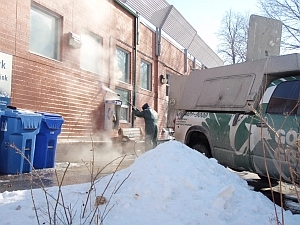 e-mail from cityrinks.ca (Jutta Mason) to Recreation supervisor Tino DeCastro, 5.30 pm Jan 26. "I've just been told that you want the Saturday posting removed from the Dufferin Rink diary. These are details seen and heard by rink users. People can see the rink coordinator shaking, and if there a loud voice on the cell, people can tell each other what they heard (and they do). The rink has many friends, many who pay attention. It's not possible to hide what goes on right out in the open, in public space. The thin ice has been a very serious problem, no wonder lots of skaters have been pressuring the rink staff to ask for more water on the dangerous areas. The rink coordinator was right to tell rink users that she was trying to get more floods, and when the other driver came on for the afternoon shift, it finally happened. Now it's much better. Please forward this freely. I wrote to Peter Leiss about this problem on Thursday (also posted), but there was no response, nor any evidence of more floods. That night it was almost cement. Let's keep our eyes on the ball here -- it's the thin ice that was the problem, and the yelling at the staff, not the posting." Weather: Started out at -14 this morning, and rose to -5 by evening. A beautiful, sunny day. There was a big graffiti tag on the front of the rink house. That kind of thing gets taken care of FAST. A "Goodbye Graffiti" truck came up and a worker sprayed some kind of "green" chemical on the wall, and -- magic -- the wall was clean again. The worker grinned when his picture was taken -- maybe he was kind of proud. The rink was packed again with kids from Queen Victoria and Dewson schools. Those schools know how to have fun. 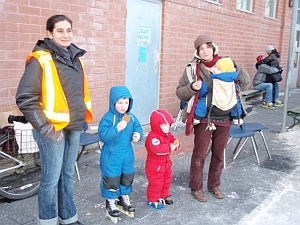 One teacher came to the zamboni cafe afterwards and bought 27 cookies for her students. Babies were crawling in between the students as they helped each other lace their skates in the rink house. The old men who usually play cards near the woodstove in the afternoons took one look, though, and turned around. No room for old men today. Tuesday is shopping day, and also muffin-making day. 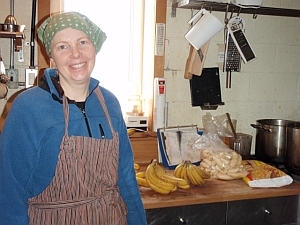 Mary, the park's vegan cook, had to prepare the banana muffins in the zamboni kitchen (off the garage) because there was no room to move in the rink house. The zamboni driver who's been so mad (about having to flood the ice an extra time, when it was getting thin last week) did not come back today, by request. To replace him, the daytime driver was asked to stay on and work a double shift. He's a cheerful man, and he shrugged his shoulders. "This will pay for Christmas." The thin spots are very much improved since all those extra floods. And the pleasure-skating pad looked like a mirror after the zamboni driver got done with the four p.m. resurfacing. The first kids on the ice after the flood said: "this ice is really slippery!" 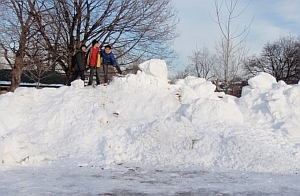 The snow hills have become enormous -- maybe bigger than they've ever been before. The loader was there sometime today and pushed the snow back to make these giant hills. The Parks staff try to clear the centre of the basketball court to make room for the zamboni when it goes out there to dump the snow. At the southwest corner of the basketball court there's an igloo of sorts, or at least, an ice house, with lots of room inside, and multiple entryways and windows. The kids say it's been there for three or four days -- nobody knows who made it. There was a big turnout for women's shinny hockey tonight, many people talking about the letter to Councillor Janet Davis. It's a bit unnerving to go and collect e-mail addresses and talk to strangers, and yet it always seems to turn out better than I expect. Everybody has a story. Suddenly it seems that the room is more familiar, there's more connection among people than at first, more good will than one could have hoped for. At the very end, a new rink staff person was washing the floor in the kitchen. There are some frayed kitchen tiles on the floor, stuck on top of good rubber rink flooring. We tore some more up tonight, and then the rink staff washed off the marks left by the old tile edges. Last thing in the building after a busy day -- a big trash bag with some old tiles, a pail with soapy water, and a rink staff person, leaving everything clean and ready for the next day's arrivals. That building must be tired, after all those many different people -- it gets to be quiet for a few hours, and dark. Weather: snow starting in the morning and continuing until early evening (15 centimeters). High -3, low -8. 8pm zamboni removed snow from hockey side. 8.45 flood of hockey pad, flood of pleasure-skating pad. Weather: A few snowflurries in the afternoon, but not much. High -2, low -8. Ice maintenance: Thin ice on hockey pad again. 9.30s/f, 12pm s/f (not pleasure-skating side because of school groups), 3pm scrape, 5 scrape, 7:30 s/f heavy flood and patch work done on hockey side. 9pm pleasure-skating side first then hockey s/f heavy flood. There was a meeting in the morning, at City Councillor Adam Giambrone's office, to try to straighten out some of the maintenance issues. It may not have gone that well. Late in the evening, the Councillor sent over a copy of a letter to PF&R general manager Brenda Librecz, with many people cc'd on it. Weather: high minus 7, low minus 15. A raw day, with a bit of weak sun. Lots of people at the rink during the day. Some of the high schools are having exams now and the students come and skate in between. Thank you for sending me a copy of your letter about two of your three Ward 18 outdoor rinks. I see that your letter asks that "onsite Parks and Recreation staff will work collaboratively to deal with any maintenance issues as they arise." 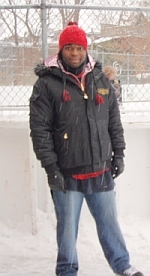 As far as I know, Parks supervisor Peter Leiss has a policy expressly forbidding on-site recreation staff at Ward 18 outdoor rinks to negotiate ice maintenance directly with their City co-workers from Parks. Everything has to go through him, although he is never onsite, nor does he have a foreman who regularly inspects the ice. 1. What exactly did Ward 18 rink staff do to get this special non-communication rule, just for them? Was it that they wouldn't stop asking for proper ice maintenance? Is this an instance of "shoot the messenger"? Or are they seen as too involved with the community? 2. According to your assistant, Mr.Leiss said at your meeting that the ice is too thin in three patches at Dufferin Rink because "the community" wants it no thicker than 2 inches. Could you find the documentation for that? Is it perhaps a "broken-telephone" version of the big public meeting four years ago, when the ice was six inches at many outdoor rinks, and the compressors couldn't manage that? I am unaware of any "community request" for thin ice, please ask for it. The councillor said he'd do a rink tour tomorrow, to try to understand all the ins and outs better. The constraints laid on by the Parks supervisor are the most important issues here; at Wallace Rink it's the lack of a zamboni. Friday Night Supper seemed very sweet tonight. It's also quite odd. For one thing, skaters -- young and old -- may be changing into their skates, or eating their supper in skates, next to people who don't come to skate, only to eat, who in their turn sit next to youth who wouldn't get near a lamb stew or a vegetarian cornbread chili, and yet who look strangely peaceful, in all that jumble of different purposes. This was another evening when it was hard not to think back of the nastyness of Fridays in the early days, before families came back to the rink. Friday evening was when the "losers," who didn't have a club date, would try to burn checker pieces in the woodstove, or shove and curse one another in the rink entryway. At one point tonight, a little group of three, just at the awkward early adolescent age, were scowling in the corner, and one of them spat on the floor. His friends looked at him and both said, "you're so stupid." He took it, and didn't say anything back. The context made it obvious that his friends were right -- why argue? So they all got up and went outside to play shinny instead. When the rink was ready to close, rink friend Will Lam came in and so did his brother Brian, who used to be a 'regular' until he went away to school. They were talking with another regular player, making plans for a real pond shinny game at her farm for Sunday. 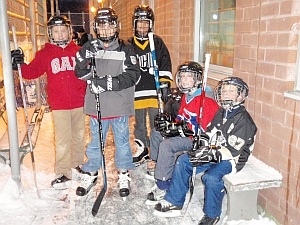 They said that some of the skaters who met playing on the "pond" hockey side at Dufferin Rink have become friends. That's what parks are meant for -- people putting themselves in the way of friendship, so it can find them. Cities are big and can be so impersonal, and there need to be places that make that bigness smaller. Like outdoor rinks. And park campfires, such as the one beside the rink tonight. Weather: High minus 5, low minus 16. Snowy and miserable from noon to 6 pm. Even so there, were a fair number of people at the rink. Today seemed to be "Japanese Day" -- so many Japanese skaters! And many skate rentals. Ice maintenance: Before 9 a.m. s/f, 12 noon s/f, 4 pm barely scraped, no flood (snowing), 9 p.m. s/f. Councillor Adam Giambrone visited the rink and was briefed on what works and what doesn't.